Autoimmunity: New insights into functional effects of the shared epitope. Crystal arthritis: New ACR guidelines for gout management hold some surprises. Rheumatoid arthritis: First face-off in RA biologic therapy declared a draw. Experimental arthritis: APRIL suppresses CIA in mice. Osteoarthritis: Clinical relevance of bone marrow lesions in OA. Lyme arthritis: Insight into the innate immune response in Lyme disease. Rheumatoid arthritis: Genetic associations with RA expanded and strengthened. Surgery: Adverse reactions to metal-on-metal implants. Clinical trials: MK5 inhibitor clinical trial shows no efficacy in RA. Paediatric rheumatology: Poor health-care transition planning for adolescent patients. Rheumatoid arthritis: Matrix predicts progression in patients with early RA. Therapy: Corticosteroid injections offer scant relief from sciatica. Inflammation: A new path to treating arthritis? Duality of fibroblast-like synoviocytes in RA: passive responders and imprinted aggressors. Paediatric rheumatic disease: Physical activity levels in the treatment of juvenile fibromyalgia. Syndecans in cartilage breakdown and synovial inflammation. siRNA-based therapeutic approaches for rheumatic diseases. T cells out of control-impaired immune regulation in the inflamed joint. Uric acid as a danger signal in gout and its comorbidities. 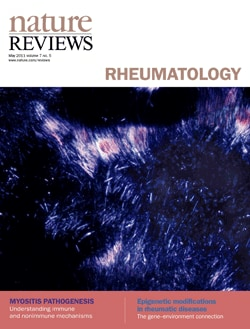 Mission Statement: Nature Reviews Rheumatology commissions leaders in the field to write clinical content of the highest quality, authority and accessibility.